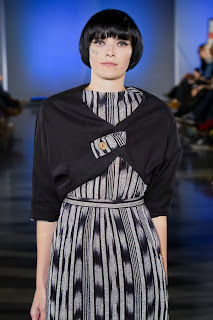 All images by Peter Jensen Photography unless otherwise noted. Each day it's a little harder to get up the next morning and write a review by noon. You want to bring a fresh perspective to each show, but the brain is on overload from seeing so many great fashions. As tiring as the week has been, I feel very privileged to have been able to attend every show at Eco Fashion Week. The schedule this season was a wonderful mix of aesthetics that kept the audience on the edge of their seats throughout. I want to take a moment and talk about the great opening image on the left. I chose it for several reasons. Take a good look, as it's so indicative of what happened all week. 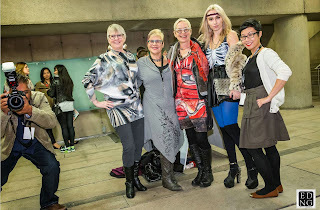 Behind us you see the outdoor walkway with other attendees talking and our fashionable bags and coats unceremoniously dumped on the floor - all for a photo op. Never thought I would ever let that coat touch the ground. In the photo are five accomplished women from different parts of the industry all celebrating the end of another exciting day and great new connections made. Last but not least is the other photographer who started out by taking our pic, and then jumped in next to us to get an image of Ed Ng taking our photo. That kind of joyous mayhem was rampant all week. I originally intended to do just one article on all four designers, but have changed my mind. 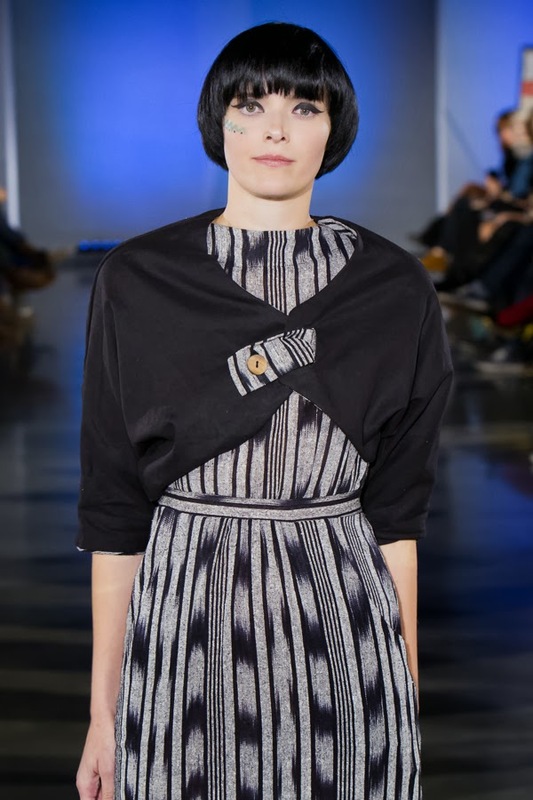 This post will feature the three who showed wearable collections and I am going to cover TildArt by Matild Janosi's more conceptual show in a separate posting. Hey Jude is the joint brainchild of Lauren Clark and Lyndsey Chow. The two love rummaging through markets and thrift store to find just the right materials - vintage pieces that can be styled and upcycled in new ways. Not only is this satisfying creatively, but the process speaks to their desire to have a positive impact on the textile industry. When shopping, the focus is on fabric, quality and fit. Ideas are found in a wide variety of places - travelling, runway, street style, art, film, photography and more. For this season they wanted challenge themselves to take their styling in a slightly new direction inspired by modern architecture, mixed textures and interesting layering, while still keeping it "wearable and on trend". The palette was anchored by white, silver, red, blue and black - with one bright yellow print seen above. I loved the layering and styling of the looks. I'm also a big fan of a long, lean silhouette which was featured in many of the looks. This was well-styled, well-paced, very wearable and modern and a great show to watch. I think this is the second season My Sister's Closet thrift store - a part of Vancouver's Battered Women's Support Services - has shown at EFW. As they always showcase a large selection of both mens and womens looks, I thought I should include a strip of each. There were as many supporters in the audience as there were backstage working. 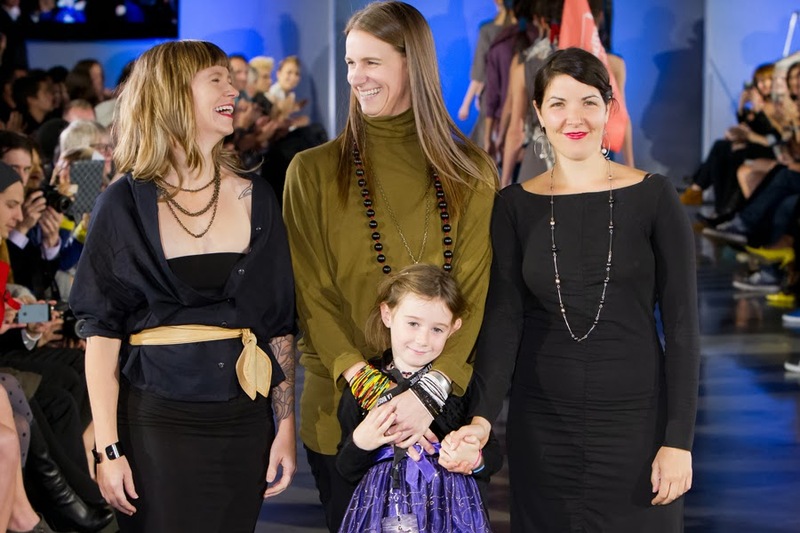 In talking with just a few, it quickly became obvious the show featured the work of a large team of amazing women who know how important the money raised by this store is to the organization's critical prevention and intervention programs. For style inspiration this season they chose the word FEARLESS. It embodie the show's combination of fashion, enterprise and mission. 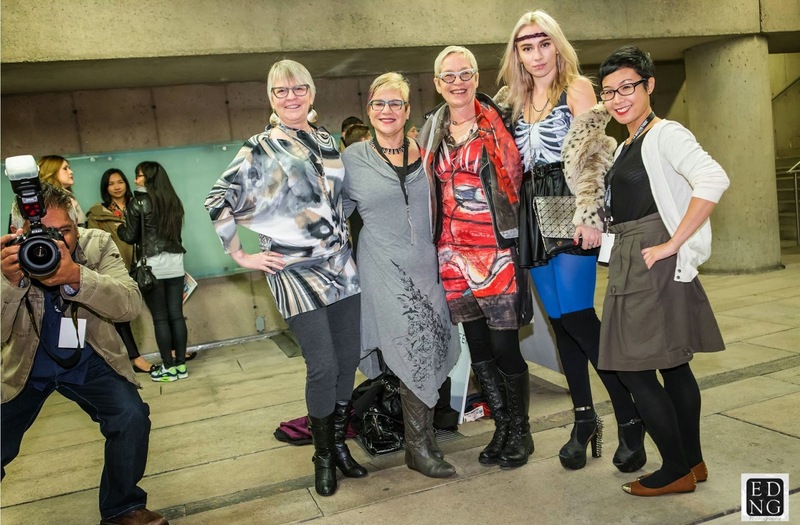 AND it's a perfect match for EFW as the looks seen on the runway were created with clothing currently on the racks in the store - vintage, thrift, new, designer, artisan and up-cycled fashion for men and women. If you are intrigued, remember every day will see new items come in, so you need to pop in often. I want to close with the organization's mission statement, "We manifest the vision of Battered Women’s Support Services and we want to change the world. Revenue generated through clothing sales fund critical prevention and intervention programs. So not only are you going to find that great outfit for work, street or special occasion, by shopping at and donating clothing to My Sister’s Closet, you are contributing to a world free of gender violence." twigg&hottie turns 10 - WE3, "Louder than Words"
This runway show presented by Vancity was in celebration of 10's - ten years in business for the twigg&hottie boutique on Main Street and ten collections of the designer's collaborative WE3 label, launched five short years ago. Longevity in the fashion industry is one of the best indications the designers are on point with what their loyal clientele wants and needs. In fact, their inspiration begins with these very women. "We seek to improve their lives and the lives of their families by being kid friendly, locally oriented. Think global, act local !" Each season's starting point is the essential pieces every wardrobe needs. Next come the complementary layers that add versatility to the collection. Last are a few avant garde pieces to take it to the next level. What do they mean by "Louder than Words"? "Communicate without saying a word – wear clothing that shows who you are. Inspired by the modern woman and made from sustainable fabrics. We3 designs are relevant to how women dress everyday: comfortable, stylish and environmentally sensitive." In line with these ideals, all garments in the collection are created from sustainable fabrics and the line is manufactured locally. The WE3 show this evening held interesting ethnic styling elements - from the make-up to the decorated sticks carried by some models. Their music mix was diverse blend that kept me rocking in my seat. Garments were offered in a true fall palette with enough variety to suit everyone's needs. Most hues were more muted, but a bright red and yellow offered extra pop. There were several prints, but my hands down favourite was the black/white offering in the centre in the top photo strip. (BTW - that short crop jacket is reversible offering another look which I liked the best - see below. A solid colour with just a print accent at the clasp). I also loved the darker blue print in the jacket shown centre in the bottom strip of images and covet the black tunic with watercolour leggings (bottom left). This was an amazing collection in tribute to their ten-year milestone. Kudos to all three designers!